Our client called us on a referral from one of her neighbors. This installation is in a second home. It seems that many times when they would come in for a stay, they would not have any hot water. 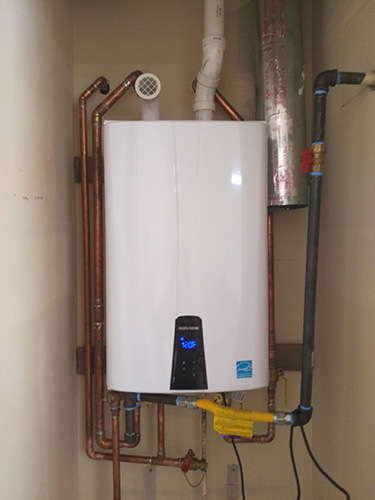 When the water heater did work, it was never consistent, and many times they would run out of hot water. We were called in to repair the existing unit, or make recommendations. Upon inspection, it was noted that in addition to the unit not working, there was also a small leak at the top of the unit. 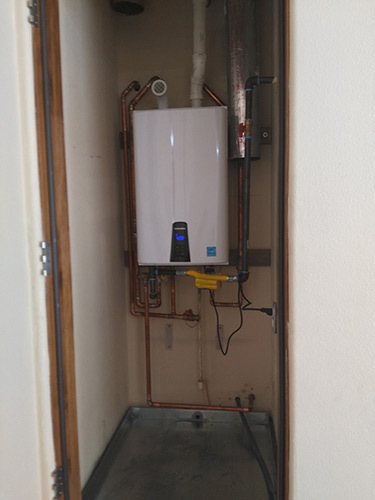 We recommended replacing with a Navien tankless unit. After installing new tankless unit, problems have disappeared. If you need a professional Austin plumber for your project, please call 512-445-5212 or complete our online request form. Moore & More almost makes needing a plumber enjoyable.